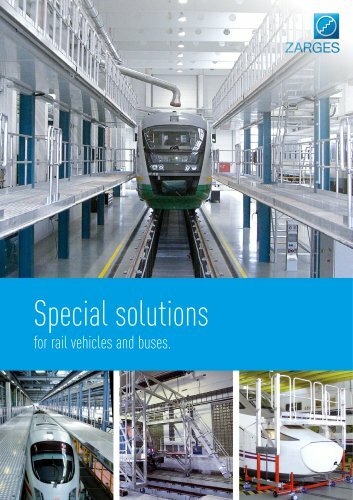 Special solutions for rail vehicles and buses. Roof working stands Approx. 92 m length. Cantilever arm technology, connection to hall construction. Swivelling steps. Approx. 188 m length, on both sides at 2 tracks. Bracket technology, connection to hall construction. Sensor-controlled front fall protections. Length approx. 42 m. Raised on stands with accessible fall protections on the opposite side. Mechanically cranked extensions. Attached storage area.